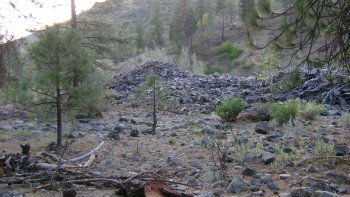 K-2A GOTTVILLE MINING CLAIM – Location: This property is located around 4 miles upstream from the community of Klamath River. The upper boundary sign is posted on a tree near mile marker 92:33. 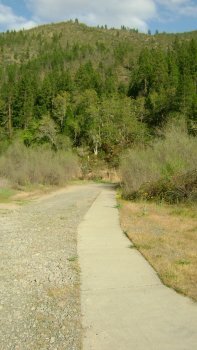 The lower boundary sign is posted on a tree near mile marker 91:83. 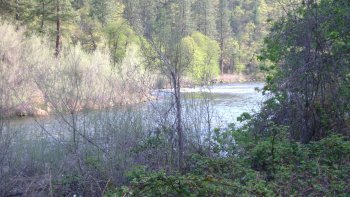 Access: There is a really nice developed USFS river access which can be found at mile marker 92:14. 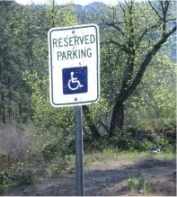 A high-quality, toilet facility exists there, along with a special disabled parking location. There is even a special sidewalk to allow disabled persons more-easy access to the river. 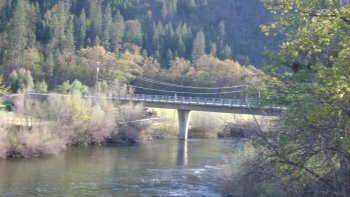 As other river users make use of this developed access, we will please need to be very mindful to not block the access with our own activity. 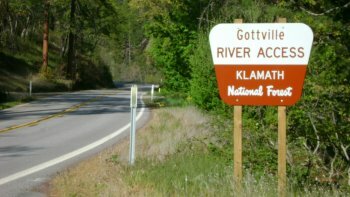 By this, we mean we will not be doing any camping down on the river access, and any parking must be accomplished in such a way as to not block access to others who will want to get in there with boat trailers and turn around. There is also some pretty good access on the far side of the river. 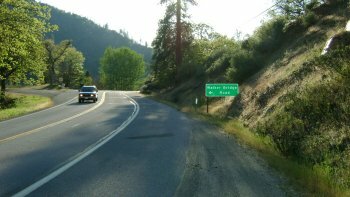 The best way to get over there is to drive downriver on Highway-96 to the Walker Road Bridge (at mile marker 84:04), turn left, and drive about 7 miles upriver on a pretty good road which exists on the far side of the river. 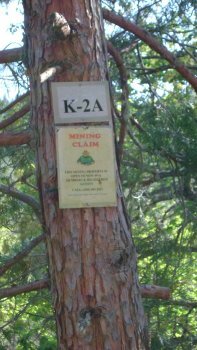 We have our claim boundaries posted over there, as well. Camping: There is a limited-sized camping area on the Highway-96 side of the river towards the top-end of the claim. 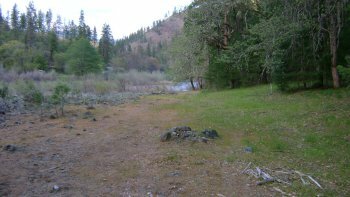 There is a larger camping area at the river access area on the other side of the river. 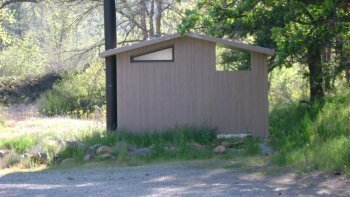 It would be smart to look at either one of these before deciding to drive RV’s down into them (to make sure you can get back out of there!). 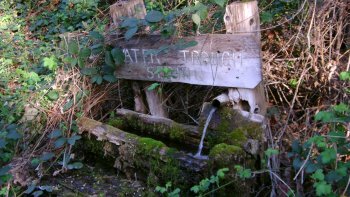 By the way, there is developed fresh water on the claim flowing from a spring on the far side of the river. 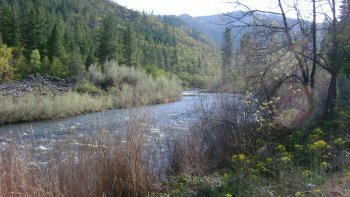 Perhaps the best camping available is located on K-2 at Skeahan Bar, which is located just three miles upriver. 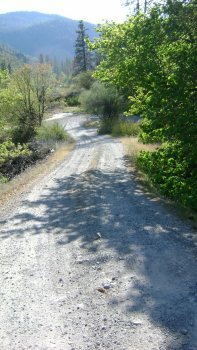 Skeahan Bar provides an extensive camping area. It is also a really good place to mine! 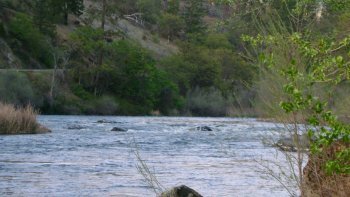 PROSPECTS: This section of river has perhaps the most proven rich mining history of all our mining properties. It is well established that one of the best ways to establish rich gold deposits today is to go to the exact areas where the old-timers found them. 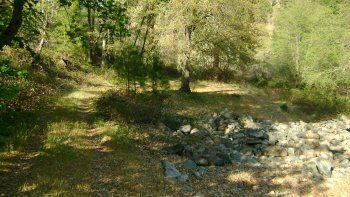 To see where the old-timers struck it rich, just look for where they left the large rock piles behind. 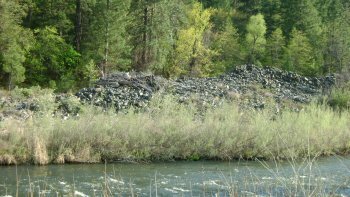 You will find more huge old rock piles in the Gottville Mining District, than anywhere else along the Klamath River. There are a bunch of them on this claim! Here follows a Sampling Report which was authored by several experienced New 49’er Members who sampled the claim before the Club purchased it. 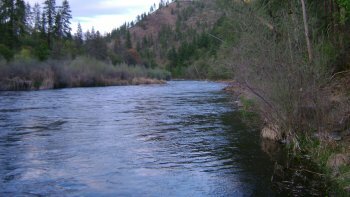 If you look at the images here, you will see that there is some fantastic river-diversity on this claim – nice river bends, some slow water areas and at least four natural riffles (rapids) which will have contributed nicely to forming well-developed gold paths and pay-streaks in the river and on the banks. 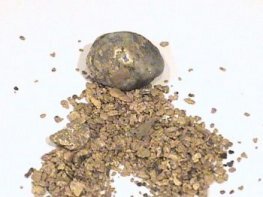 While we have reports of nice gold coming out of the piles, there should be good potential in the dry streambeds alongside of the river, too. 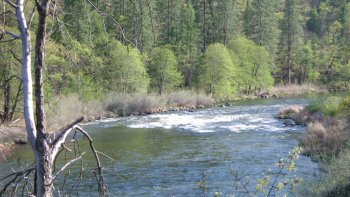 Based upon the sampling report authored by Sean, there should be some, for lack of an easier term, “recreational” excellent dredging opportunity within a re-deposited pay-layer that is close to the surface of the river-bottom. 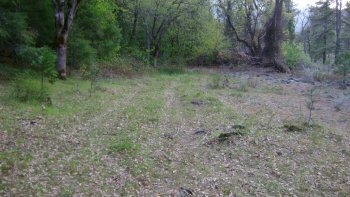 By “recreational,” we mean perhaps the pay-dirt can be reached with smaller-sized dredges or members who are not able to invest substantial time and/or physical effort (we all have our personal limitations). 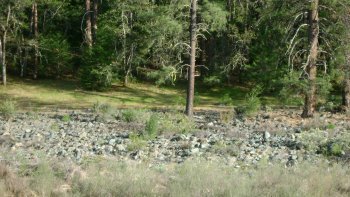 There is going to be some very serious, commercial dredging opportunity for those members who possess the experience and resources to access the remaining original streambed at the bottom of the river. There will be some rich gold deposits on this claim!